Week 4 to 8 is when change is occurring rapidly for baby puppies. This blog will deal with the changes in week 4 – 6. 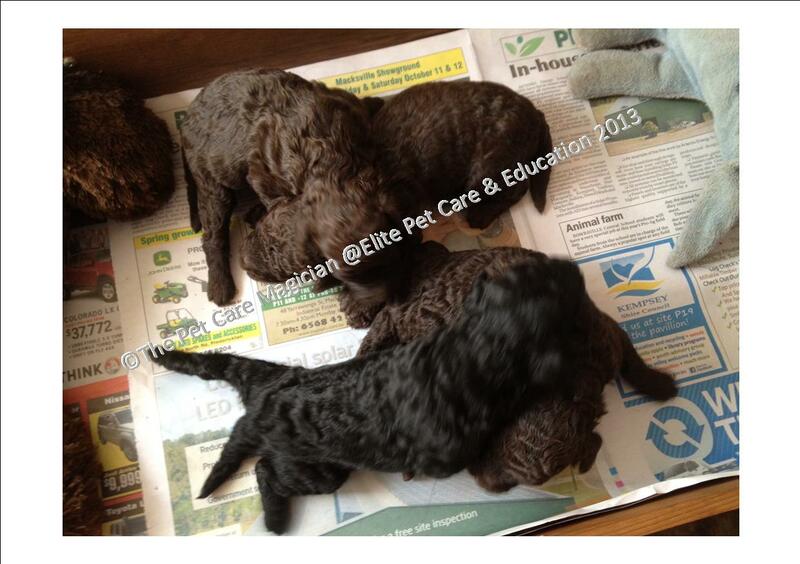 In the last blog (click here) I was talking about the puppies being still very much in the xpen. From 5 weeks of age they start to find out ab0ut the big wild world outside of the pen. This has to be done with caution of course as they are susceptible to many diseases and accidents at this age. They have fairly good immunity from disease still from mum but it is not good for them to be in environments where the disease or vaccination status of other animals is not know. As they are tiny they also must be carefully supervised around even the best tempered adult dog. Baby dogs like human babies have no comprehension that a growl is in fact a signal to back off. They just keep coming and can be far to “in the faces” of adult dogs. They carefully started interaction with selected adult dogs. Recall training is started (off lead using pup, pup, pup whenever I wanted them to come to me). Puppies start to explore their environment. They play more and more with each other and bite inhibition is learnt. A good day/night regimen is formed. Separation anxiety is guarded against by letting them spend time alone away from humans. The start of grooming and handling training by touching feet, noses, ears, mouth etc. They learn that humans are associated with rewards that are delivered for when a behaviour happens that is acceptable. At this age there is only use of +R and a very light amount of -P (in that if they are whining they don’t get attention) However the owner should be ensuring that no whining occurs as all needs should be predicted before that point. These weeks build on the solid foundation of the previous 6 weeks. If all has been done well then by now puppies are confident, eating well, sleeping through the night, not barking, not whining and interested in exploring new environments, people and animals that come their way. They are not showing signs of being unwilling to go somewhere new and are happy. healthy bouncy puppies. Now actually interacting with adult dogs and learning how to use cut off signals to indicate they are no threat and learning that they can not rush headlong into the face of an adult dog. Learning from their litter mates how to use their teeth in play. Being separated from humans and other dogs for part of the time so that separation anxiety is not going to become an issue. Introduction of enrichment toys such as food dispensing toys. Spending time as single pups away from other dogs so they can handle being an only dog. Exploring the outside world and finding out about wind, rain, horses, cattle, leaves, trees and that fences mean containment. Learning how not to be afraid when they hear loud sounds like radios, gun shots, trains, cars, trucks, babies crying etc. Just a quick comment on vaccination. I follow the most up to date schedule for vaccination from Dr Jean Dodds, a world expert on vaccination, and do not give the first vaccination (C3) until puppies are 8 weeks of age. I then only give one more after 16 weeks of life and then no further vaccination for the rest of the life of the dog. I also do not microchip until as close to over 8 weeks as possible as I feel it is fairly traumatic for baby puppies. It is required as a condition of sale in my state. The puppies are wormed at 3 and 6 weeks and then again as they are about to go to their new homes. Establishing a good relationship with a puppy or dog is not just about teaching them to sit, stay or come when called. Grooming is a vital part of their basic training and in my opinion training adult and puppy dogs to accept the grooming process is very much over looked by groomers, trainers and pet parents. The grooming process is not natural for dogs, especially when very aversive equipment like clippers and high velocity dryers are used in the process. Dogs need to be taught to accept the equipment and the handling that inherent in the grooming process. Puppies such as poodles, have a coat that requires high maintenance and it is important that a relationship with their owners and/or professionals is established based around grooming as early as possible. This relationship must be one based on trust that they will not be frightened by the equipment required and that the person undertaking the grooming has an ability to observe and interpret canine body language. If you are not proficient in understanding what a dog looks like when it is scared and how to stop that from happening then you should not be grooming any dog, let alone a vulnerable baby puppy. Video One shows how to develop a caring and as stress free grooming relationship as possible for a puppy. This miniature poodle puppy is 7 weeks old and step one is to get it used to being up on a high table and to accept the attention from brushes, combs and being touched in an way that is not natural for a dog. An important point is this is not done after washing a dog. It is undertaken at a totally different time when the pup is totally relaxed. Stacking the activities of a scary wash and then up on a high table will increase the stress for the pup and set him or her up for failure before you even start. The second very important point is that restraint SHOULD NOT BE USED during these initial grooming training sessions. My reasoning is that dogs that get frightened of something need to be able to move away from it. Adding any sort to restraint in grooming training will automatically make it an aversive process so that the pup is unable to learn as it is stuck in fear mode. Learning to handle restraint should be done separately once the puppy is comfortable on the table. The puppy should never be left on the table and all equipment should be placed in advance so that the handler can keep one hand on the pup at all times. This can be done at home by owners using a table with a non slip bath mat. Not only does it train for grooming but it also gives valuable one on one time that enables relationship building. The next step in the grooming process is teaching a dog or puppy not to be frightened of a dryer. The high velocity dryer is THE most abusive item of grooming equipment in a dog grooming salon. Most dogs are terrified of it and have every right to be so. It is a piece of equipment designed for groomers who want to do the maximum number of dogs in the shortest period of time. It is one of the big reasons I can no longer subject dogs to the practice of professional grooming. It is vital that any dog that will be attending a professional groomer is trained to accept this practice. How long it takes for a dog to become ok with this process depends on the skill of the groomer in reading canine body language and the overall socialization and fearfulness of the dog or puppy. This training should NEVER be done when the dog is being presented for its first groom. Watch the dog and stop immediately you see escalation of minor stress signs such as lip licking, freezing, ears back and yawning. The next video is with a different puppy and shows some of the signs to look for in a pup that is not ok with the process. Pup stopped eating so counter-conditioning was not being effective as pup was too scared by the process. Dryer needed to be further away. Body Language becomes stiffer, more lip licking, not able to head turn and became stuck in one place on the table. Reward used was not high enough and scary object was too close. Pup startles at 1.30 minutes indicating it went into fear mode. This is just a quick overview of training puppies for grooming using positive force free methods. It is part of a larger body of work I am putting together. If you need assistance on an particular grooming issues please contact us via the comments section or email. Two weeks since my last post and these two weeks has been seen a large amount of development in the puppies. By 4 weeks they are all up and about and social skills are starting to develop. They are still feeding off mum but I have now implemented supplementary feeding. Not that they eat much, mostly they walk through it, play with and generally just explore it. Today while videoing I did see one of them pick up a piece of dry food in it’s mouth and eat it. What mostly happens is that mum goes in there as the food is taken in and she is gradually teaching them to eat rather than drink. However she did take her piece of chicken in there this afternoon and there was a great deal of interest in it with a couple of the puppies having a taste of it. Mum however will be still allowed to let them drink for as long as she decides is appropriate. They are now starting to look outside their xpen as I have removed some of the covers so they can start to interact with the other adult dogs and with me as I move around the area. Mum is now spending less and less time with them and mostly only going in for feeding and if they make a strange sound (which has not happened so far at all). However what this means is that all the clean up is now my duty not hers and this is often the point at which families who have bred a litter for some fun find out the fun is pretty much over and the constant cleaning starts. They have started to interact with each other in play. This is an essential time for puppies to learn bite inhibition. Bite inhibition is taught by the other pups who provide the feedback when a bite is too hard. A puppy will not continue to play with another pup if bites hurt. At this point I keep a careful watch for any puppy that might be showing bullying tendencies. This is fairly unusual for miniature poodles but does happen from time to time in bigger breeds. The way to deal with that is to quietly distract the bully from the game and institute a short time out session. It is normally is just an indication that a pup is a bit too wound up or a pup is slightly more ahead in development than its litter mates. About two weeks ago, once mum started to spend less time with them, I added some soft cuddle toys to the pen. Initially this was to give them something soft to cuddle up to but as they are now playing these also become play toys. The benefit of this is that often individual pups will be found sleeping alone not cuddled to one of the others and also once it comes time for them to move off into their new homes they will associate a cuddle toy with positive safe feelings from where they first grew up. I have also started to introduce novel safe items to them. Yesterday it was some peelings from the potatoes and carrots I was cooking. Not for any food value, although some were eaten, but to give them a chance to explore new tastes and textures and weird things appearing in their environment. Today it was the empty cottage cheese container with a few morsels of cottage cheese still in it. This provides the game of how many puppy heads can fit in here at once that you can see part of on the video. They have settled into an excellent day and night rhythm now. Once it is dark they all settle for bed and not a sound is heard from them until we get up the next morning. I was involved in an interesting discussion today on a Facebook group I belong to which is called Building Strong Relationships with Animal Companions. We were discussing the impact of training on these relationships. It got me to thinking about the role of training in my relationships with animals. I am an animal trainer and have been professionally and non professionally for over 40 years. I have always been considered as having a gift for training animals but I will let you in on a secret. I actually don’t do a great deal of training with most of the animals I live with! Sure I teach them the basics; sit, drop, stay, come but outside of that unless I want a particular behaviour for a video or a demonstration I don’t do any formal training sessions. Yep you heard that right – no formal training sessions. But I can hear most of you saying “Your dogs are so well trained, they listen to your every word”. Yes you are right they know exactly what I am thinking and most of the time I know pretty well what they are thinking. Years ago I used to attend classes at one of Sydney’s best know dog obedience schools called Manly and District Kennel and Dog Training Club and I trained under the late and very well know NSW top obedience trainer, Garry Sommerville, who held that title for years. We drilled the dogs for an hour, round and round and in straight lines up and back and I went home and religiously drilled the dog/s for 30 minutes each night. Sit, stay, drop, down, come, fetch, pick up dumbell the whole full obedience routine and I, sort of, had reasonably trained dogs but boy was it hard work. All those years ago I was of course using jerking on check chains and physically placing my dogs into position. I confess I did a few alpha rolls as well. (This was back in the late 80’s). I loved my dogs that goes without saying but mytraining interactions with them were not loving ones. Fast forward to the year 2009 when after spending years as a balanced trainer moving closer and closer towards modern reward based methods I decided to train as a Delta instructor where the method uused was totally positive reward based force free training. BUT what I also learnt about was how dogs learn, how they think, how to read their body language. What that did, along with the use of reward based training was taught me how to understand and establish a relationship with the animal I was working with, which is over and above just training it. By removing all the forceful elements I had to work out how to get the dog to interact with me willingly and that takes relationship building. For my own animals at home I interact with them all day and night most days. I talk to them, think about them, listen to them and yes they listen to me, talk to me and in so doing we have all developed a relationship. I don’t just ignore them until it is time t0 put a lead on and have a “training session”. When I require something I ask them to do it e.g go out to and get in the car, go through a doorway, wait before coming inside, going out to toilet. I talk to them endlessly always stating in a non confrontational manner what it is I require. I talk with my hands a great deal as well, so I expect I also inadvertently give a great number of non verbal body language cues to match my verbal cues. I am training them, every minute of time that I am interacting with them we are training but more importantly I am building a very strong relationship with them as well. They know and understand what I require and I know and understand what their needs are. The fact that it is a two way communication is what makes it a relationship not just training. Because it is two way is why it is so effective as training. Much more effective than the older methods I used to employ. With both you have a match made in heaven without a good relationship the training will be very hard work but with it the training will be effortless and I love effortless training. 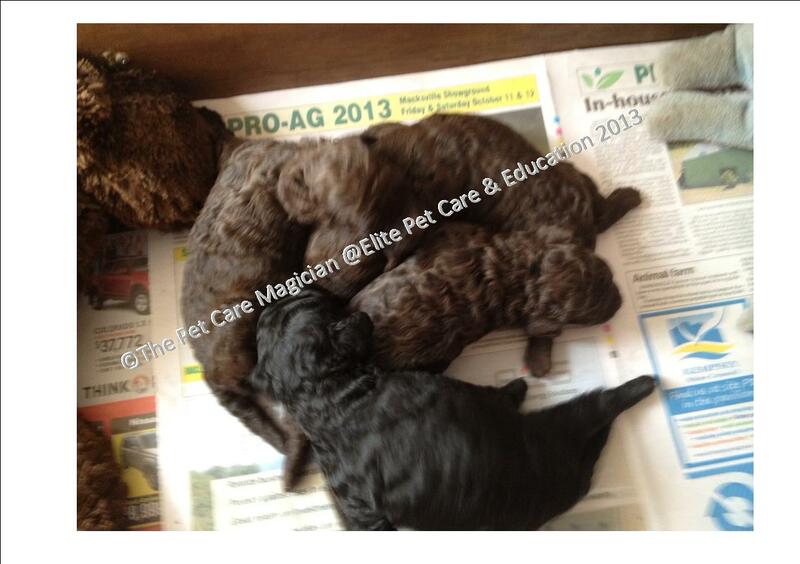 The miniature poodle puppies are now 2.5 weeks of age and are entering a period where they absorb new things rapidly. Their eyes are open and their hearing is developing. They are no longer content with the confines of the whelping box and one by one they have climbed out to investigate the rest of their enclosure. Mum is now spending less and less time with them. Initially she was with them most of the day and all of the night however now her days are spend mostly outside the pen (but still near enough to keep an eye on things) and jumping back in to clean up bottoms, wipe eyes and open the milk bar. When she finishes feeding she might spend a little while in there with them if she has fallen asleep while they feed and at night she comes into bed with me for a few hours then returns to spend the rest of the night with the puppies. The pups are drinking more at each feed but feeding less often and they are quiet and content with fat milk bellies. In fact, I rarely hear a sound from them. At this stage I start to introduce different surfaces for the pups to feel. The newspaper is still down to cope with poos and wees, but I have also introduced an old outdoor seat cover which is slightly higher and rougher. Mum really likes sitting on this so she often goes in and lies down there to feed. This means the pups have to work out how to get to her and how to navigate the slight height involved. This is building problem solving skills in the pups. 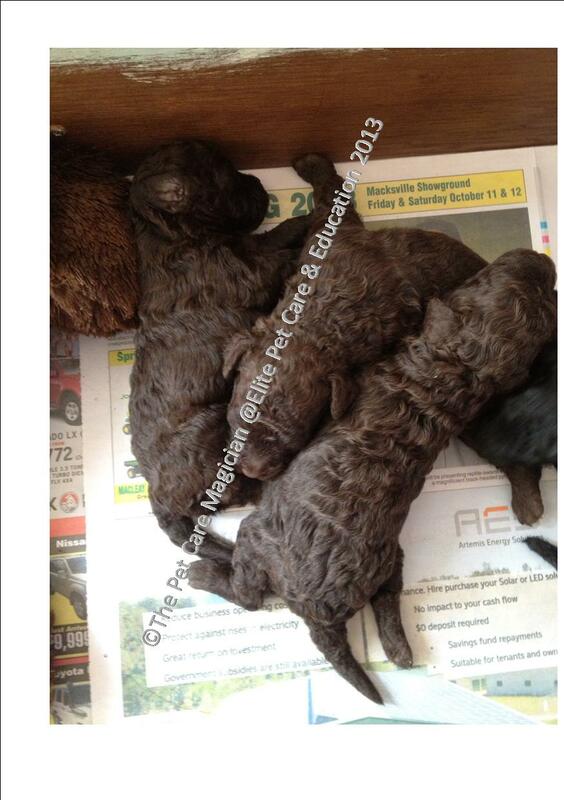 The miniature poodle puppies are now 2 weeks old. There is hardly a noise out of them as they have all settled in a lovely routine of feed and sleep. It has been hot the last couple of days so they are starting to sleep apart from each other rather than in a tight bundle. Cherry is gradually spending less time with them now that they are more settled. Their bellies are full of lovely milk and they sleep contentedly, even the black puppy that I called a boy on the last post but is a actually a girl. They are starting to get up on their feet and very shortly eyes will open. This is when I start to work with them as their eyes open and they gain an awareness of their external environment. Here is video also taken this morning. Relationship Animal Training starts from the first day a puppy is born and it is now day 4 for Cherry’s miniature poodle litter. Sadly one pup (brown boy) did not make it past day 1 so there are now 4 puppies. In those circumstances I believe it is best to let the mother decide if the pup should or should not survive. Nature knows a lot more than I do about survival of the fittest and Cherry gave clear indications that she did not want to feed this pup as she repeatedly pushed it away. The little black boy is slightly behind his three sisters when it comes to development, however that is normal for boys. He still whimpers slightly when mum is away but is getting faster at settling down against his sleeping sisters as there is safety in numbers. I have also included one of Cherry’s favourite toys in the whelping box so that her smell remains when she is taking toilet breaks. At this stage she is still spending all but a few minutes of her day with them. As soon as I was awake this morning I opened my eyes to find her standing next to my bed, saying hello,, however she quickly returned to the pups. There are implications here for later puppy training. The first is that of prevention of separation anxiety which is a reasonably common and serious behavioural issue in dogs. At this early age the puppies are very dependent on their mother for their emotional security and safety. As they are still blind and deaf they rely on her scent and body warmth to feel secure. They are not yet secure in just the presence of their litter mates for more than a few minutes. Cherry is aware of this but has already started the slow process of teaching them that she is not required 24/7. The very interesting observation however is that she is doing this using finely honed skills of positive reward, negative punishment and wonderful innate canine judgement. She returns to them only when they are quiet and ignores them when they are lightly grumbling and about to drift off to sleep on their own. Of course she manages the situation by going immediately to them when she knows they need her for other reasons. The second implication is for teaching no barking. Rewarding a dog for barking by constantly talking to it or otherwise paying attention to the barking is counterproductive to achieving a quiet dog. Cherry is teaching the puppies how to appropriately ask for her attention. I am resisting the urge to cuddle and interfere. Louise Kerr (aka The Pet Care Magician) runs the Pet Care Magic club where devil dogs, horrible horses and crazy cats are turned into perfect pets. The program provides owners and pet professionals assistance with with common pet behavior training, feeding and grooming issues such as barking, escaping, scratching, aggression and fleas She consults and writes widely on a range of pet care issues for owners and also assists pet care professionals in setting up and growing their businesses by the provision of customer handling advice, sales and marketing strategies and up to date product information that allows for the differentiation of their pet care business from their competitors. The Pet Care Magic Club is part of Elite Pet Care & Education based in the Nambucca Valley NSW Australia but can be found on internet enabled devices worldwide. Relationship animal training TM starts before puppies are born. The selection of the right mother and father, ones who complement each other in temperament and structure and then the appropriate health screening of these dogs to determine if any hereditary health defects are present. Then comes the feeding, training and housing to ensure these two dogs will not pass on any environmental health or behavioral issues. The care of the mother is paramount during the 61-63 days of pregnancy, keeping her well fed, wormed, free of parasites and as unstressed as possible. Then you sit and wait while her belly gets larger and larger. The final few days are spent ensuring the mother has somewhere warm, dry, comfortable and safe (from her perspective) to have the babies. If all goes well she will do much of what needs doing with no intervention from you however that is not always the case. In either situation be prepared for at least one sleepless night or longer in the case of large litters. In Relationship Animal Training TM it is important that the person who bred your pup knows how to bring them into the world correctly, right from the time of conception, as everything that happens from that point on will affect the temperament of your dog. At the time of whelping trust the mother to know what to do and resist the urge to intervene. The role of the human guardian and leader is to trust the mother to know what is best and to support her needs, keep her safe from infections and provide the nutrition and safety she needs to raise the pups in as stress free an environment as possible. If the mother is stressed then Cortisol is released and this has effects on her and the puppies. Here is Cherry Coco and her pups the day after birth. She appears to be a bit rough at times but is actually stimulating the pups as required and knows when to have some time away from them and when to settle down and sleep while they feed and fall asleep cuddled close. The first week it is time for mum and puppies to be left alone, in a secure place of least interference so that the bonding that is required happens. This forms the start of Relationship Animal Training TM because a puppy that has not been conceived well from a well bred, health tested mother and father and then allowed to be brought up as a dog by another well adjusted dog is not going to get the best start possible in its life as a human companion. Follow the blog to watch this litter of pups progress through all the stages of Relationship Animal Training TM for puppies. How do animals learn using Positive Reward Force Free training? Animals are learning all the time, right from the moment they are born for every minute of every day. Right now your animals are learning irrespective of where they are and who is with them. They may be learning behaviours we like or behaviours we don’t like. 1) Classical-Conditioning (CC) – where the environment is acting on the animal to cause behaviour to occur. Horse example: open the feed shed door and the horses come running. CC has taught them that the noise of the door predicts food is coming. Show the worming paste tube and horses run or clench their jaws – tube has come to predict a not nice taste and an argument with the handler. Dog example: go to the cupboard where the treats are kept and you will get a dog that wants a treat. Let’s put that in English: Unlike CC where the environment acts on the animal, OC is what we traditionally think of as training. It is when a verbal or non verbal cue, or tool is used to ensure a predictable (85% of the time) response to provide a learned cue. Horse example: Horse moves from one pace to another on verbal cue, In +ve training – horse opens mouth when worming syringe appears, horse is taught to move backwards on cue without being touched or forced with pressure release, horse moves left when touched in a specific spot and/or a cue word is used. Note: the words are mostly for our benefit as most animals use non verbal body language cues. Dog example: you say sit and the dog sits. You touch the dog’s lead and they go crazy jumping all over the place. How do we achieve OC? 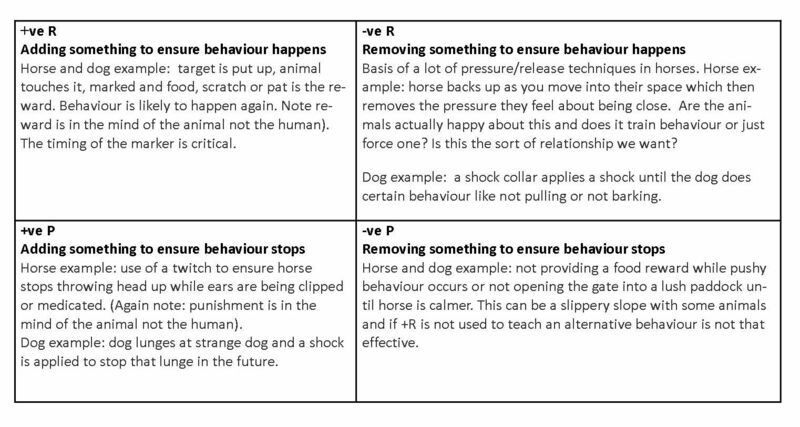 All good and bad behaviour is achieved by the use of the 4 quadrants of operant conditioning. These are positive (+ve) and negative (–ve) reinforcement (R) and positive (+ve) and negative (–ve) punishment (P) with the four words all having very specific meanings in terms of learning theory. Punishment means to ensure behaviour decreases not necessarily to punish – but for most of the time it is punishing; it depends on what you are doing and how you are doing it. Punishment being in the eye of the animal not the trainer. Don’t get caught up in the terminology and differences in methods. Set your animal up for success and don’t get caught up in the terminology. Do no harm and try wherever possible to work on the animal providing the behaviour you want rather than being coerced into it. I.e. stand on your head and turn your brain inside out as we have been conditioned to using +P and – R and not +R and -P. If you find you are always using -P then you are doing something wrong and need to go back and look at what you are asking the animal to do. At first it is hard then soon it becomes the only way you think. The fun comes back into the relationship as you are not in a WIN/ LOOSE relationship but in a WIN/WIN that both parties want to continue. You are having fun and so is your animal. I call it laughter therapy for trainers and handlers. What is positive reward (FF) training and how does it differ? It is not just a training method it is a method that allows a deeper more meaningful relationship with any animal, even strange animals you have never met before. This is because it works with the animal where they offer behaviour because they want to not because they are forced to. It is mostly trained with the animal not restrained in any way. In horses I start with them totally at liberty in a large paddock. With dogs start off lead in a secure large area. Aims to stay as much as possible in the quadrants of +R however that is not always possible and occasionally –P is used. In fact many things we do even outside of training are –P. We have no choice at times but to tie up a horse or dog, make them take wormers, have dental work done etc. Using positive reward means that we become aware of the impact we are having on them and get used to the fact that we allow for them to want to retreat at times. It integrates +R and –P so that least impact occurs for the desired outcome. The basics can be altered to address many training situations, especially for horses where it can also be used during riding. Worming, fitting equipment, lifting feet, moving in any direction, loading onto a trailer or into a crate, standing still for mounting, changing gait, having a saddle placed on an unbroken horse, coming when called, improving flexing of neck and all limbs, ear cleaning, nail trimming and medication. In fact once the basic skills of targeting and learning a marker work are mastered there is not one thing that positive reward cannot be used for. Once practiced regularly it improves the overall relationship between human and the animal horse and the animal keeps asking for opportunities to interact. NO more forcing behaviours that we require to happen such as trying to catch them. For a demonstration on using positive reward force free training with horses please click here.